WATKINS, Minn. - Sandy Hansen knows what it feels like to be at rock bottom; she's been there. But with a little determination, lessons learned the hard way and a good team of supporters, Sandy and her business have made it back on solid ground. When her husband, Randy Hansen, passed away from complications with leukemia on Jan. 3, 2003 - just one year after they were married - Sandy became the owner of a business she knew nothing about, in an industry she knew little about. Randy had owned AgVenture Feed and Seed Inc. - a full-service feed and seed supply store in Watkins, Minn. - in a partnership since 1993. Shortly before he was re-diagnosed with cancer in August 2002 (he was originally diagnosed in August 2001), he bought out his partner and became the sole owner of the business. "He was excited about being on his own," Sandy said of her husband. At that time, Sandy was working as an insurance agent. Although she had grown up on a dairy farm near Albany, Minn., she had little experience in agriculture beyond that, and the details of Randy's business were something they rarely discussed. From August 2001 to March 2002, Randy underwent monthly chemo treatments. After a short remission during the summer of 2002, the cancer was back that August. In October 2002, Randy began a bone marrow transplant. Through it all, Randy remained optimistic and had every intention of returning to his business once the battle with cancer was won. But just before he began the bone marrow transplant, Sandy pushed Randy to talk with her about AgVenture and what would happen if he did not survive. "One evening he scribbled down on a sheet of paper what he all had and what would happen with the business. I used that sheet of paper a lot after he died," Sandy said. "His suggestion was to sell the business if he didn't make it." When the time came, however, selling was not an option. 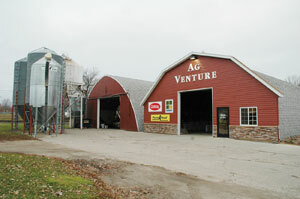 Between Randy's absence, the low economy and the recent buyout, AgVenture was near financial ruin. Sandy took a leave of absence from her insurance job and entered a world unknown to her. "I didn't feel like I had a choice [but to keep the business]," Sandy said of why she didn't sell. "My goal was to figure out the business and sell it, but it was in way too deep to ever break even. I didn't feel like I had a choice but to try and turn it around." The following months were very difficult for Sandy. At a time when all she wanted to do was grieve the loss of her husband she was forced to make some hard business decisions and appear strong to the community. "I went through a very challenging time. I didn't know the business, but we couldn't appear weak to the community. We had to prove we were still a viable entity," Sandy said. "Looking back to that period of time, [I felt] I was hanging on to a knot at the end of a rope hoping I could keep hanging on and make it through." Initially, it was a challenge just surviving the tragedy, emotionally as well as financially. "Every day I wondered if this was the day the bank would say, 'No more,'" she said. Another challenge was being a woman in a male-dominated industry, especially having no prior knowledge of the business. Some tough lessons helped her get through. One of those lessons was opening up to others. "For a long time I wanted to hide in a cave. I wasn't open to listening," she said. "One lesson I learned was to start listening to what others said. I began listening to the employees here; they knew more than I did. I began asking them continuous questions." "The 'school of hard knocks' also teaches you pretty quick when something doesn't go well," she added. "I said a lot of prayers." Two people that helped her - and AgVenture - through were Jeff Brinker, Randy's nephew, and Rick Hansen, Randy's brother. 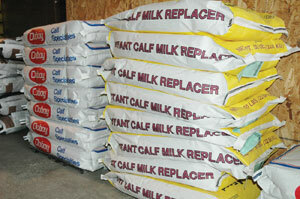 Jeff had worked at AgVenture several years and often acted as manager when Randy was gone for treatments. Rick came on in September 2003. Together, the three acted as a support system for each other and slowly turned the business around. They sold AgVenture's semi truck, made a few staff changes and took on a new feed line and new customers when one local feed dealer closed. They also began taking advice from the experts around them. "We started taking a team approach [to the business]," Jeff said. "That's important - not to operate in isolation. That's what I did [at first]," Sandy said. "In hindsight it's very toxic. You need to find a confidant to support you through the tough times." "There's a lot more power working in a team than working in isolation," she said. In the seven years she has owned it, AgVenture has more than quadrupled its sales, an accomplishment that is at times awe-inspiring. "I'm very thankful and humbled by it," Sandy said of AgVenture's success. "It's almost surreal that we are still here. We had some really neat people that gave us a chance." Among those people are AgVenture's customers. "We have lots of loyal customers and we're thankful for that," Rick said. "They allowed us the opportunity to figure [the business out] and gave us a chance," Sandy said. Basic hard work and determination were what carried them through in the end. "We always had an attitude of a flicker of hope, that if we tried long enough [the business] would live," Sandy said. "We had the desire to see it live." With AgVenture back on solid ground, Sandy, Rick and Jeff continue to look for new directions in which they can take their business. While Sandy has no current plans to sell the business, she has taken a different role in its day-to-day happenings as she networks to continue building AgVenture as well as her second business - Rock Solid Motion. Rock Solid Motion is Sandy's motivational speaking business that was formally started one and one-half years ago. Through it, Sandy tells her story of loss and growth and how she made it through. She now works with businesses and various community groups to assist them in finding the path during times of hardship. It is something she and Randy had planned to do together. "It was our dream that we would share our story together," Sandy said. "I remember the afternoon we talked about it. We were going to share with others the biggest lessons we learned through our struggle with leukemia." Although Randy is no longer by her side, Sandy is living out the dream for the both of them and has done talks across the country. In each session, Sandy uses the trials and tribulations from her own life to motivate and give hope - topics very relevant to people struggling in today's economy. "I really felt we were at rock bottom for a long time, so far down we couldn't see the light," Sandy said. "That's how a lot of people are feeling right now." "Right now the economy is concerning to me, but I look back and - in comparison - it's not so bad," she said. "If you just try and keep going something has got to break eventually."